Between Evans Dr. and Scott Ave.
On June 19, 1778, George Washington's army left their famous Valley Forge encampment after spending the previous six months there. They made their way across New Jersey through Lambertville, Mount Airy, Hopewell and Kingston. They were in pursuit of British forces who had evacuated Philadelphia the day before, and who were marching across New Jersey to New York. 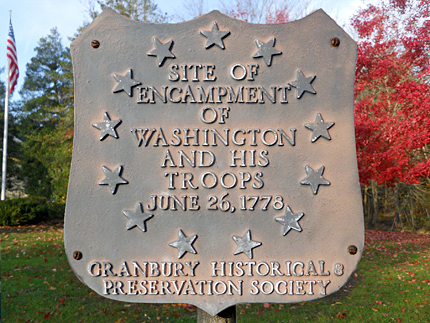 "In the evening of [June 25, 1778] the whole army marched from Kingston, where our baggage was left, with intention to preserve a proper distance for supporting the advanced corps, and arrived at Cranberry early the next morning. The intense heat of the weather, and a heavy storm unluckily coming on, made it impossible to resume our march that day without great inconvenience and injury to the troops. Our advanced corps, being differently circumstanced, moved from the position it had held the night before, and took post in the evening on the Monmouth road about five miles from the enemy's rear, in expectation of attacking them next morning on their march. 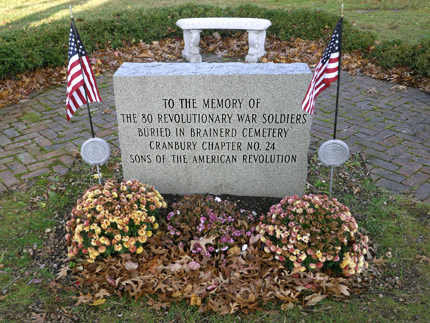 The main body having remained at Cranberry, the advanced corps was found to be too remote, and too far upon the right, to be supported in case of an attack either upon or from the enemy; which induced me to send orders to the Marquis [de Lafayette] to file off by his left towards Englishtown, which he accordingly executed early in the morning of the 27th." This house is a private residence. Please respect the privacy and property of the owners. 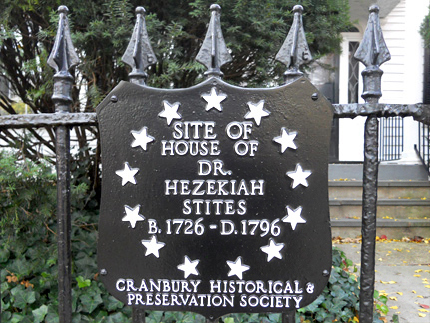 The owner of the house, Dr. Hezekiah Stites, is buried a quarter mile from here at Brainerd Cemetery (See next lower on this page). The house itself was demolished circa 1850. 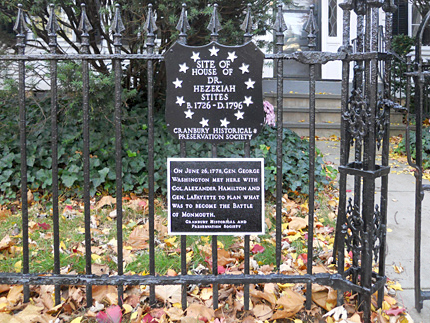 The site is marked by these two plaques on the gate in front of the current house. 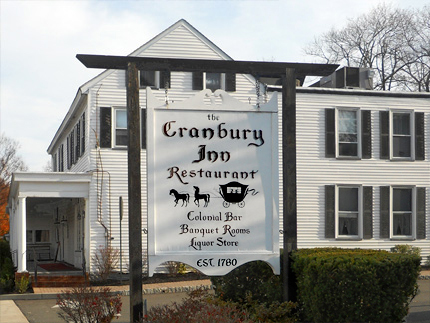 The Cranbury Inn, which is still a working restaurant, was established as Handley's Tavern in 1780 by Richard Handley. Handley served as a Colonel of the 3rd Regiment Cavalry, N.J. Militia in the Revolutionary War. North Main St., near Scott Ave. 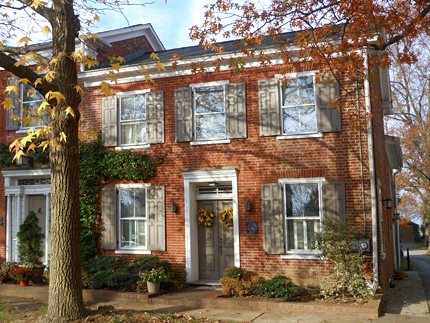 This house was built by Colonel David Chambers circa 1790. David Chambers was born in 1748 in Trenton. 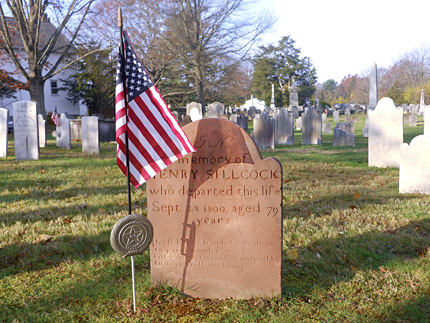 He served as a colonel in the Revolutionary War in both the Hunterdon County militia and the New Jersey State Troops. 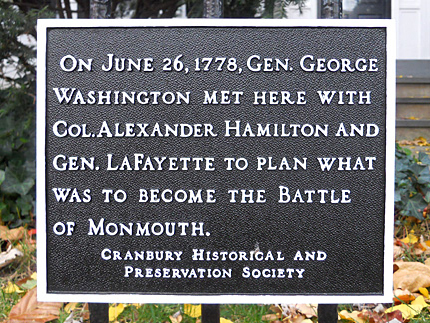 He fought at the battles of Germantown and Monmouth. He died in Cranbury in 1842. Colonel Chambers is buried at the Westminster Cemetery, located on Westminster Place, about a quarter mile from this house. 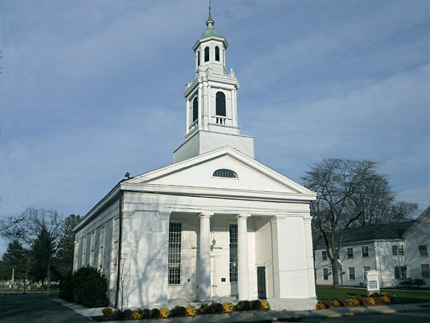 • For more information and accompanying source notes about the other locations mentioned in this entry, see the Lambertville, Mount Airy, Hopewell and Manalapan pages of this website. • Washington's arrival on June 26 is attested to in his letter to the President of Congress mentioned in Source Note 2 above. In addition, there are two of Washington's letters that appear in the same The Writings of George Washington, Volume V dated "Cranberry, 26 June, 1778," which appear on pages 418 - 419. 5. ^ Names taken from a marker at the front of the cemetery, which lists the book Cranbury, Past and Present by Ruth Walsh (published 1975) as its source. 6. 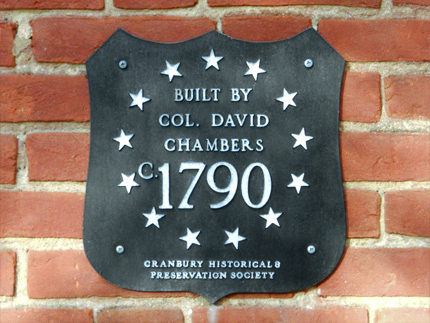 ^ 1790 date, and house identified as being built by Colonel Chambers drawn from the Cranbury Historical & Preservation Society plaque on the house. • William S. Stryker, Official Register of the Officers and Men of New Jersey in the Revolutionary War (Trenton: Wm. T. Nicholson & Co., 1872) page 351. 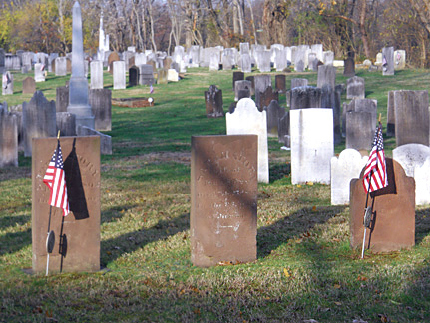 "Colonel, Third Regiment, Hunterdon, June 19th, 1776; Colonel, battalion, State troops, November 27th, 1776; Colonel, Second Regiment, Hunterdon September 9th, 1777; resigned May 28th, 1779"